Based on the different national and regional conditions of the programmes, the framework offers an overview of programmes, how such services are implemented and what participants and alumni make of it. 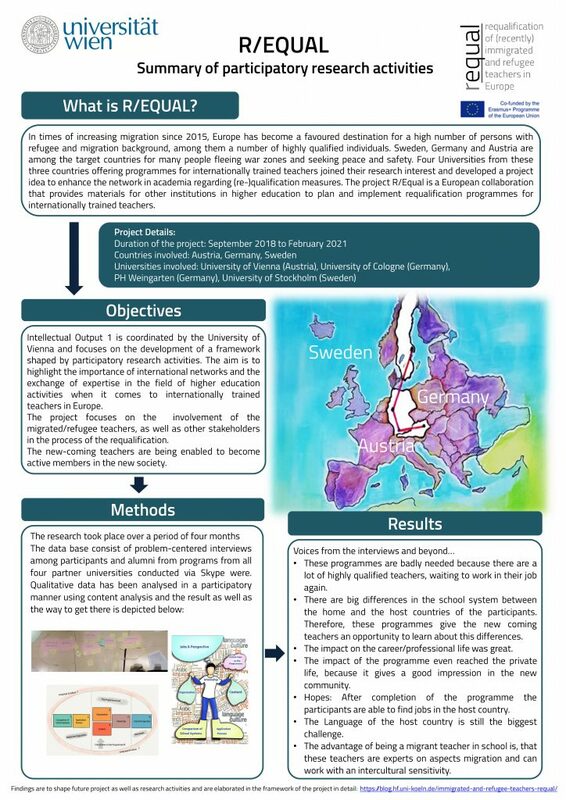 The framework’s aim is to help institutions in Higher Education in Europe and abroad offer programmes for (recently) immigrated teachers and give an insight in the programmes’ current state of the art in Vienna, Cologne, Weingarten and Stockholm. Since the framework – despite all differences in national regulations on migration and teacher training – is based on shared theoretical assumptions and convictions of the importance of corresponding support for internationally trained teachers, we speak of a transnational framework. It is not so much a question of a national comparison, but of a common idea from a European point of view, which the partner universities in R/EQUAL understand as educational institutions with global social responsibility. R/EQUAL is a transnational cooperation project that lives through exchange and mutual enrichment and reflection of the partner organisations. The framework is to guide future activities but can also be considered as a living document that might be enhanced over time.